Military and economic tensions are increasing due to the ramped-up warlike-stance of the US establishment. The impossibility of halting the shifting world order in favor of prolonging the unipolar moment has left the US deep state reaching for any available weapon at hand, taking no heed of the dangers and consequences of such a reckless foreign policy. The Vostok 2018 troop exercises have started in Russia's Far East. Taking part in the drills are about 300,000 Russian troops, over 1,000 aircraft, helicopters and unmanned aerial vehicles, up to 36,000 tanks, armored personnel carriers and other vehicles, up to 80 ships and supply vessels. Exercises similar in scale have not been held since 1981 when the Zapad-81 drills that involved about 100,000 troops were held in the Soviet Union's Belarusian, Kiev and Baltic Military Districts and in the Baltic Sea. The inclusion of a relatively small Chinese contingent in this year's edition [Vostok 2018 military exercise] is not quite the signal of a military alliance that some see, but it has certainly made the West take notice. It's hard to escape the symbolism when as Russian and Chinese troops were training together, Putin and Xi Jinping were holding a summit and pledging closer business and political cooperation. At a time when Washington and Europe have tried to isolate Moscow diplomatically, this is clearly intended as a message that Putin is still capable of making connections with countries not willing to follow the West. The Eastern Economic Forum held in Vladivostok marks yet another significant point in the new Sino-Russian strategy to isolate and limit Western-induced chaos, strengthen the support for countries affected in one way or another by Washington, and expand cooperation in every direction possible. The economic ties between the two countries' production systems deserve attention, especially in light of future agreements between the industrial giants of the two countries. The partnership is broad and goes far beyond the territories of Russia and China. Technological cooperation is expanding in regions such as Africa and South East Asia, often symbiotically offering important agreements to third countries. Civil nuclear energy and arms sales seem to be Moscow’s speciality, just as generous loans and joint development of basic resources (hospitals, schools, water networks, sewerage, motorways, ports) are Beijing’s. Such offers of assistance are important for capturing not only the attention of Third World countries keen to break free from the West’s colonial chains, but also of those countries that need to transition quickly into the new multipolar world order. 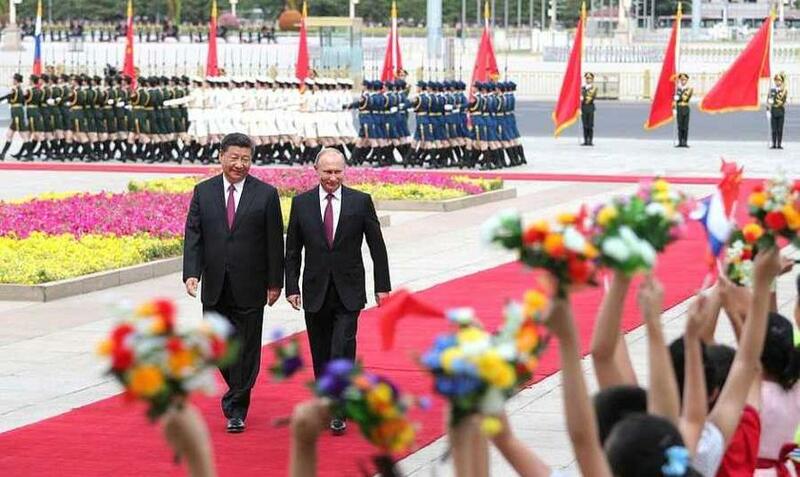 An example is Japan, with Abe also present in Vladivostok, exploring ways to balance the Chinese expansion in Asia. In reality, such a reading belongs very much to the Western way of thinking, in which everything must be seen in zero-sum terms. What many in the West struggle to understand, especially among European and American journalists and analysts, is how Washington's attitude over recent years is actually serving to push together the four Euro-Asian giants of China, Russia, Japan and India. While maintaining sometimes strong ties with the West, the trend is decidedly different from the past. Abe was in discussion with Putin to sign the long-awaited peace agreement between the two countries. India seems increasingly anxious to expand its strategic independence, especially from an energy point of view, cooperating with Iran and ignoring Western sanctions, and from a military standpoint, buying the S-400 air defence system. In general, a multipolar environment of international relations already prevails in vast areas of the planet, both from a military and economic standpoint. De-dollarization appears to be an inevitable trend for the purposes of achieving significant economic sovereignty, thereby avoiding the vulnerability of US-dollar blackmail as a destabilization tool used by Washington and the Federal Reserve. With an imminent economic crisis in the West, fuelled and exacerbated by more than ten years of artificially printed money (quantitative easing), an economic prophylactic is a priority for Washington's declared rivals (Iran, China, Russia). The consequences for the international financial system could be much more serious than the two previous crises of 1929 and 2008, especially according to Chris Hedge in his recent analysis. The logic of imposing more than $200 billion in tariffs on Chinese products, and then asking for strong support from Beijing in mediation with Pyongyang, seems more like the moves of a desperate person rather than those of an amateur. Even historical allies like South Korea, Pakistan, India and Turkey, as repeatedly stressed recently, fear Washington’s irrationality and politics of "America First" and are running for cover. They are diversifying energy resources and ignoring American diktats, buying armaments from Russia, cooperating with China in large infrastructure projects to connect the vast Eurasian continent, and participating in economic and financial forums to diversify funding and cooperate on a new and industrial level. Indeed, the strategic triangle that emerges between Tehran, Beijing and Moscow, seems to draw all the neighbouring countries into a large geopolitical waltz. A transition to a multipolar reality brings many advantages to Washington's allies, but it also brings many tensions with American oligarchs. The example of the sale of the S-400 in Ankara is an important wake-up call for the oligarchs of the American military-industrial complex, who see a potential loss in revenue. In the same way, the creation of an alternative system to SWIFT strongly reduces the centrality of American banking institutions and thus their political weight. We must also keep in mind Sino-Russian actions in Africa, which are progressively breaking the chains of Western neo-colonialism, thereby freeing African countries to pursue a more balanced foreign policy focused on their national interests. This transition phase that we have been living in over the last few years will continue for some time. Like an already written script, the trend is easily discernible to a lucid mind free of Western propaganda. Erdogan certainly is not a person to be completely trusted, and the talks in Astana should be understood in this light, especially if viewed from the Russian-Iranian point of view. Yet such cooperation opens the door to an unprecedented future, although at present Astana seems more like an alternative to a bloody war between countries in Syria than a conversation between allies. Syria's future will unavoidably see the country’s territorial integrity maintained, thanks to allies who are now disengaged from the Western system and are gravitating around centers of power opposed to Washington, namely Beijing, Moscow and Tehran.